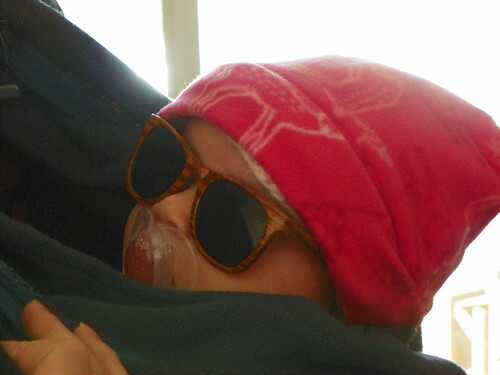 Here’s 4-month-old granddaughter Coralie, looking very cool in her shades, ready for a stroll outdoors. 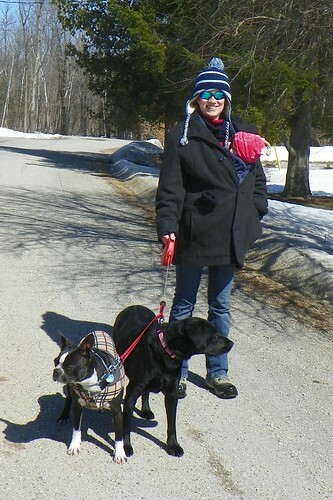 Even well-wrapped against the cold, she can enjoy the blue sky, bird song, and other tastes of the natural world. With two parents who are deeply committed naturalists and ecologists, she is sure to be a Wild Child. Studies show that in the space of a generation, children have nearly ceased all outdoor activity, with the average American boy or girl spending just 4 to 7 minutes a day outdoors, a drop of 90% from their parents’ childhood days. In an interview with radio host Tom Ashbrook entitled Hey Kids! Go Outside, Already! author and TV host Dr. Scott Sampson argues for the benefits of raising a wild child. The interview with Sampson, author of How to Raise a Wild Child: The Art and Science of Falling in Love with Nature is linked here. A & W Canada, the second largest burger chain in the country, has been promoting its hamburgers as containing ‘better beef’. “We were hoping that we’d be able to deliver on the product that most of our customers were asking about, which is beef without any added hormones or steroids,” said Susan Senecal, chief marketing officer of A & W Food Services of Canada. ​Senecal said A & W will also buy from producers who use antibiotics only for therapeutic purposes, and whose animals are free of additives and preservatives. 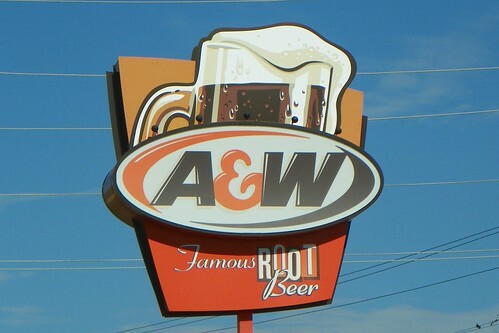 At A & W, we are passionate about quality. That’s why we serve 100% Arabica coffee. We are also committed to socially and environmentally sustainable practices. 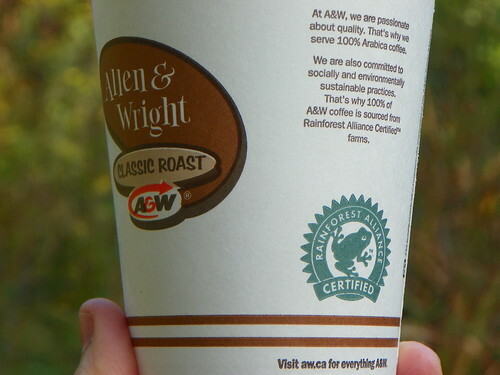 That’s why 100% of A & W coffee is sourced from Rainforest Alliance Certified farms. So on this, International Coffee Day, here’s a shout-out to A & W. Thanks for offering consumers an environmentally-friendly coffee choice! For more information about the Rainforest Alliance, follow this link. In honour of International Coffee Day, September 29th, I am reposting an entry from three years ago. Shade the coffee, shelter the birds! Love Coffee? Save a Bird With Every Cup. 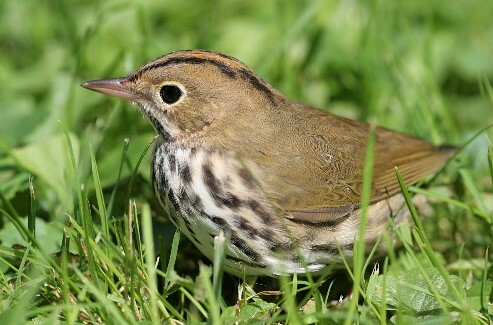 It’s the time of year when many of the birds we have enjoyed all summer, ‘our’ birds, make their long, perilous journey south, completing one of the most amazing feats of the natural world. Many of those birds will spend their winter on coffee plantations. A native of Ethiopia, coffee was introduced to Brazil by the mid-1700s, and coffee plantations today cover an estimated 7 million acres in the northern Neotropics from Columbia and Brazil to Mexico. Traditionally, coffee has thrived in shaded woodlands, but in order to produce crops more quickly, sun-tolerant coffee plants were developed. Full-sun farming requires the removal of the forest and replaces it with a virtual biological desert. Without the forest birds to eat insects, and decaying materials to feed the plants, sun-grown coffee requires the heavy use of pesticides and fertilizers. At least half of the coffee grown in the Neotropics has been converted to full sun. Buying shade-grown coffee is probably the most important thing you can do to help save the rainforest and protect migratory birds. These days, shade-grown coffee is widely available in supermarkets and specialty stores. Sometimes you have to read the label carefully to verify that the coffee is shade-grown. Too expensive? Don’t drink that much coffee? Here’s an easy alternative: Look for Rainforest Alliance Certified coffee. 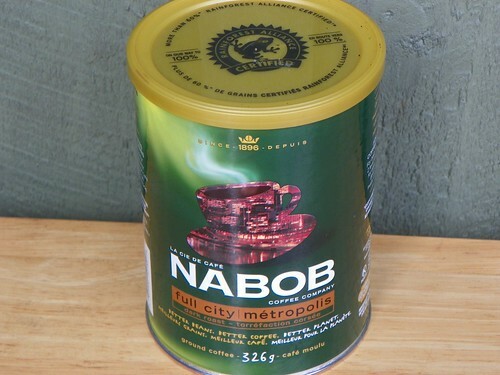 Nabob is a product of Kraft Foods, one of a few corporate giants that control 40 to 60% of the coffee market. According to the label, Nabob is currently more than 60% Rainforest Alliance Certified and working towards 100% certification. Still drinking instant??? Most instant coffee is made from the poorest, sun-grown beans. If you purchase an inexpensive one-cup or small-pot coffeemaker, brewing the real thing is very fast. You can enjoy a better cup of coffee and help the birds with a minimum effort. Wake up and smell the coffee! The birds will thank you. For more information about shade-grown coffee, see my Shade the Coffee, Shelter the Birds post. For plenty of information on many aspects of coffee and habitat, visit the site linked here: Coffee and Conservation. When choosing plants for the garden, I try to keep in mind the needs of garden visitors. Not people who may drop by, but a host of birds, butterflies, bees and other pollinators who enliven the garden every day. And when I’m outside, working in the garden or just strolling, I like to keep my camera close at hand for opportune photo moments. Some of the butterflies that I was lucky enough to ‘capture’ with my camera this season are featured here today. Opening the post is a Viceroy butterfly, a look-alike of the well-known but disappearing Monarch. Viceroys are a bit smaller, and have a distinctive black line across their hind wings. 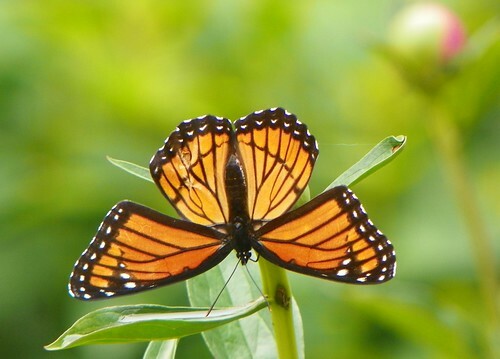 It was thought that Viceroys benefitted from their mimicry of Monarchs as predators avoid the bad-tasting Monarch, but research suggests that the Viceroy has its own disagreeable taste that wards off birds. In addition to nectar sources, butterflies also need host plants to serve as nurseries for their caterpillars. Pollinators of all types, including butterflies are under severe pressure from the overuse of pesticides and habitat destruction. Any contribution you can make with your garden is a help. Some butterflies have very specific requirements for host plants, while others are generalists. Monarchs are well-know to use milkweed. Viceroy caterpillars use willows. There are many willow species, and some, such as corkscrew willow or blue arctic willow, can be pleasing additions to a garden. 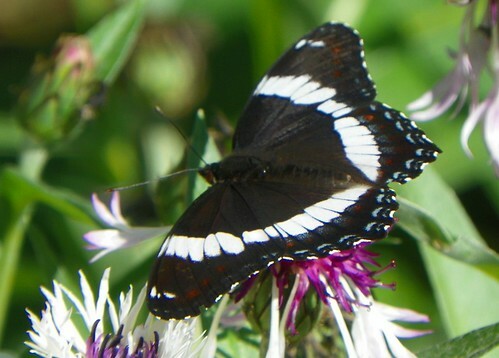 The White Admiral is closely related to the Viceroy, and also uses willows, cottonwoods, poplars and related trees as its larval food source. 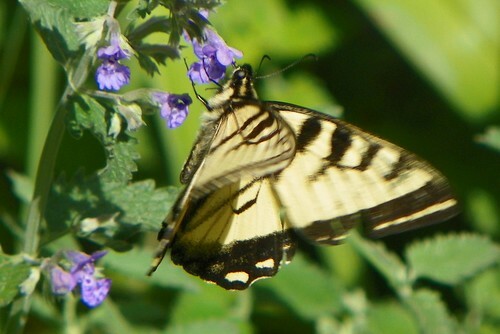 Here’s a Canadian Tiger Swallowtail visiting catmint. The Canadian is very similar to the Eastern Tiger Swallowtail, but ranges farther north. It is a bit smaller than its southern cousin. Its larval foodplants include birch, aspen, black cherry and other trees. 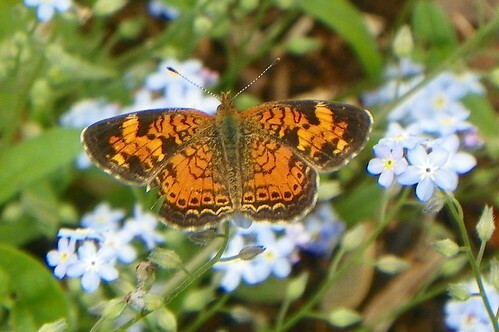 Here’s a Pearl Crescent on the last of the spring forget-me-nots. Pearl Crescents are small butterflies, but their brilliant orange and black pattern is eye-catching. Their larval foodplants are asters. Northern Pearly-eyes are rapid flyers. They’re usually found in woods or in meadows near a water souce. 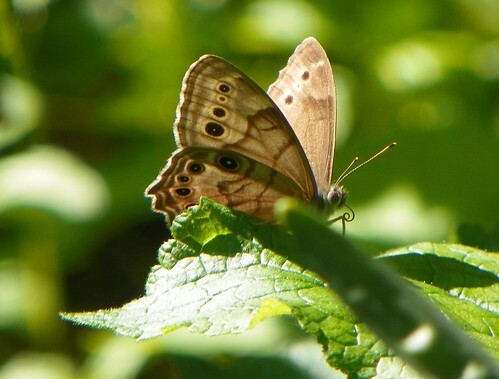 Unlike many other butterflies, they don’t visit flowers, but land on tree trunks or trails or low vegetation. 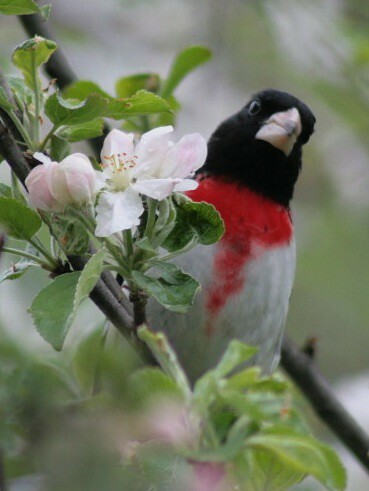 Adults feed on dung, fungi, carrion, and sap from willows, poplars, and birch. Grasses are their larval foodplant. Finally, here’s a Great Spangled Fritillary. The adults nectar on many varieties of flowers, but the larval foodplant is specifically violets. A good source of information about butterflies is the Butterflies and Moths of North America website. 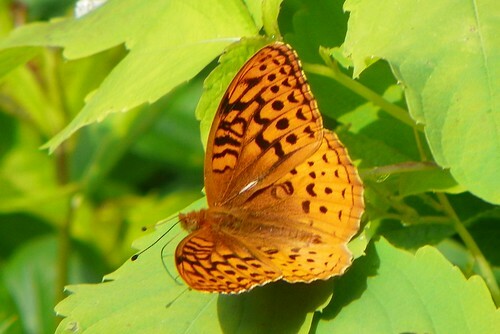 The page highlighting the Great Spangled Fritillary is linked here. 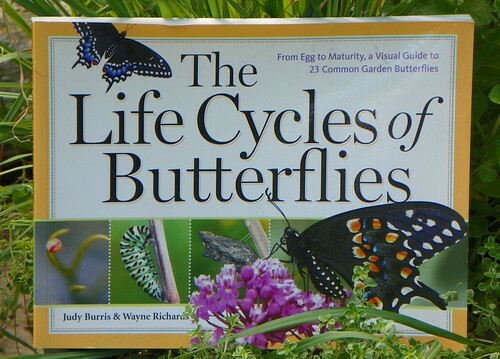 A very nice book that features beautiful pictures of the life cycle of 23 common butterfly species, from egg to adult, is The Life Cycles of Butterflies by Judy Burris and Wayne Richards. It offers a terrific introduction to these amazing creatures, and is quite highly recommended. 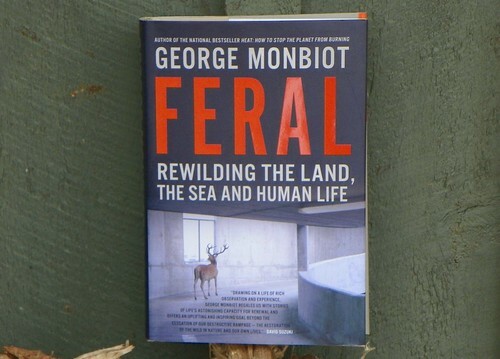 Feral: Rewilding the Land, the Sea and Human Life by George Monbiot. Penguin Canada 2013. It is an extraordinary thing for a foreigner to witness: one of the world’s most sophisticated and beautiful nations being ransacked by barbarians. It is more extraordinary still to consider that these barbarians are not members of a foreign army, but of that nation’s own elected government. The world has watched in astonishment as your liberal, cultured, decent country has been transformed into a thuggish petro-state. The oil curse which has blighted so many weaker nations has now struck in a place which seemed to epitomise solidity and sense. This is not to say that there were no warnings in Canada’s recent past. The nation has furnished the world with two of its most powerful environmental parables: one wholly bad, the other mostly good. The story of the collapse of the North Atlantic cod fishery reads like a biography of the two horsemen of ecological destruction: greed and denial. The basis on which the stocks were managed was the opposite of the Precautionary Principle: the Providential Principle. This means that if there’s even a one percent chance that our policy will not cause catastrophe, we’ll take it. Foreigners and seals were blamed for the depletion of the fish, while the obvious contribution of the Canadian fleet and the Canadian government was overlooked. The fisheries science was rigged and, when it still produced the wrong answers, disregarded or denounced. The government continued to sponsor bigger boats and new fish plants even as the stocks were crashing. A moratorium was imposed only after the fishery became commercially extinct: government and industry, after due consideration and debate, agreed that the non-existent fish should no longer be caught. Even today, the best means of ensuring that stocks can recover and breed freely – declaring a large part (perhaps the majority) of the Grand Banks a permanent marine reserve in which no fishing takes place – has not happened. All over the world the evidence shows that such no-take zones greatly enhance the overall catch, even though less of the sea is available for fishing. But the Canadian government continues stoutly to defend the nation from the dark forces of science and reason. 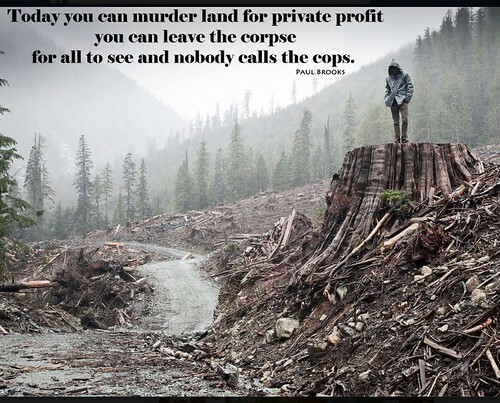 The other great parable which still resonates with the rest of the world – the battle over Clayoquot Sound – began the same way: private companies were given the key to a magnificent ecosystem and told they could treat it as they wished. The forests would have followed the fishery to oblivion had it not been for a coalition of remarkable activists from the First Nations and beyond, who were prepared to lose their freedom – and possibly their lives – to prevent a great wound from being inflicted on the natural world. In 1994 they won, for a few years at least. Their courage in the face of police brutality and judicial repression inspired peaceful direct action movements all over the world. So here are the two Canadas: one insatiable, blindly destructive, unmoved by beauty; the other brave, unselfish and far-sighted. There is no doubt about which of the two is now dominant. For Canada today is providing the world with a third parable: the remarkable, perhaps unprecedented story of a complex, diverse economy slipping down the development ladder towards dependence on a single primary resource, which happens to be the dirtiest commodity known to man. The tar sands poisoned the politics first of Alberta then of the entire nation. Their story recapitulates that of the Grand Banks. To accommodate rapacious greed, science has been both co-opted and ignored, the Providential Principle has been widely deployed, laws have been redrafted and public life corrupted. The government’s assault on behalf of the tar sands corporation on the common interests of all Canadians has licensed and empowered destructive tendencies throughout the nation. Well. That’s not the end, there is more in this vein. Monbiot clearly sets out the state of Canada today. He does note: For those who appreciate natural beauty and understand ecosystem processes, it must feel like living in a country under enemy occupation. It must also be intensely embarrassing. Canada is becoming a pariah state, whose name now invokes images formerly associated with countries like Nigeria and Congo. Canadian friends joke that they stitch U.S. flags onto their rucksacks when they go abroad. Indeed, I have felt more than embarrassment at the disassembling of my beautiful country. I have felt great anger and despair. About the only defense I could call upon is the fact that the current majority Conservative government was elected under our Kooky, anti-democratic election system by a minority of Canadians amongst a flurry of sick, vicious attack ads, robocalls and election fraud such as one associates with a third world country. It is impossible to explain, however, the know-nothing care-nothing attitude of Canadians across the country. Canadians pride themselves on being ‘polite’, but the manner in which citizens have sat back and turned a blind eye to the gutting of environmental legislation, to the targeting of charitable environmental organizations as ‘terrorists’, even the crushing of democratic processes, suggests Canadians are lazily complaisant, selfish and self-absorbed, unable to care about anything beyond the latest hockey scores, maybe their latest electronic gadget. We are entertaining ourselves to death with make-believe stories of hobbits and dragons and super heroes even as our own real world crumbles around us. Oh Canada. Who stands on guard for thee now? Big Oil and the Federal Government would have you believe that Canada’s greatest resource is bitumen. It’s not. Canada’s greatest, most spectacular, irreplaceable resource is fresh water. Life depends on water. And Canada is blessed with approximately 25 percent of the world’s wetlands. Wetlands are fabulous ecosystems, brimming with an amazing diversity of life. In fact, wetlands are as productive as rainforests and coral reefs. And wetlands filter and purify the water we all depend on. But Canadians have not been good stewards. 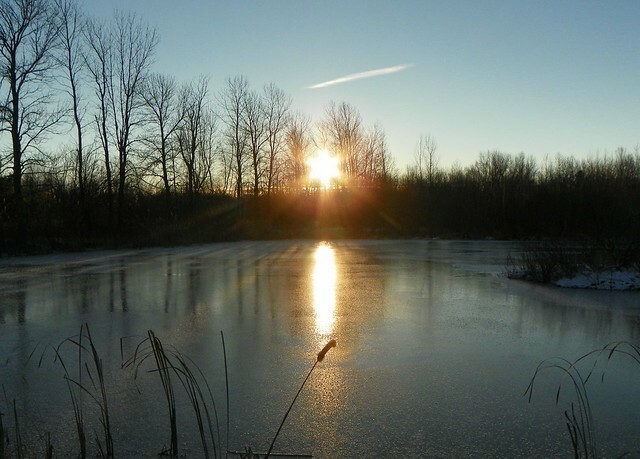 Seventy percent of Ontario’s wetlands have been drained. Sixty-five percent of Atlantic Canada’s coastal marshes are gone. Seventy-one percent of prairie wetlands have been lost. Eighty percent of the Fraser River delta has been developed. Canada is losing its most vital ecosystems. 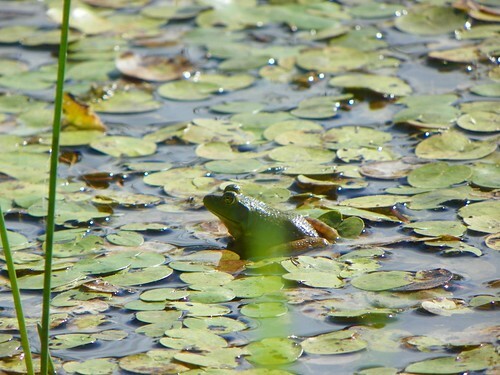 The Nature Conservancy of Canada works to preserve some of Canada’s most threatened wetlands. You can read more about their work at the Campbell River Estuary, BC; the Minesing Wetlands, ON; Tabusintac Estuary, NB; and Musquash Estuary, NB by following this link to their website. On this, World Water Day, please consider making a donation to the Nature Conservancy of Canada at www.natureconservancy.ca. Help save Canada’s wetlands.